How to Celebrate Ganesh Chaturthi in a Traditional Way? Ganesh Chaturthi celebrates the birth of Lord Ganesha, the beloved son of Lord Shiva and Goddess Parvati. For believers of Hindu philosophy and religion, Ganesh is considered to be the supreme god of wisdom, fortune and prosperity. While the festival is celebrated throughout India and other parts of the world with much pomp and show, the celebration turns most elaborate in Indian states of Maharashtra, Gujarat, Andhra Pradesh and Tamil Nadu. The origin of the festival lies in the holy scriptures of the Hindus. There is a legend that goes behind the creation of Lord Ganesha and why He is worshipped at every auspicious occasion and festival before any other form of God. The Ganesh Chaturthi festival celebrates the creation of Lord Ganesha amidst prayers and chanting of mantras and Vedic hymns from the Rig Veda. The festival begins 2-3 months prior to the day of Ganesh Chaturthi, when the making of a credible clay model of Lord Ganesha begins. The size of the model varies and may go up to 25 feet. It is placed on elaborated platforms for people to view and pay their homage on the day of the festival. A priest chants Vedic mantras and instills life into the idol, a ritual called ‘Pranpratisththa’. 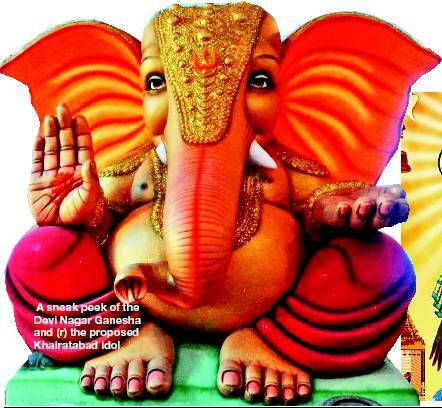 This festival is widely celebrated for 10 days in Hyderabd & Secunderabad with the devotees praying bhajans for lord ganesha. Some of the popular bhajans are listed below. Ganesh pooja is done by all the family members on the day of ganesh chaturthi. The pooja is performed with the following items. The idol of lord ganesh is kept in the raised platform and with the presence of all the family members. Then pooja is performed by praying bhajans. Business man who aims for success in his life and business. For curing the health related problems. Blessings to get good education, health and peaceful life.